Healing Resonance Articles by Kristi Borst: Life Is Meant to Be Savored ... YOU Are Worthy! When we are children we are more closely connected to our Divine natures ... we have not yet pulled the hood over our awareness that we are Divine as we so often do in adultHOOD. What do we do for our children when they are young and having a birthday? We create or buy for them the most wonderfully decorated cakes. Rarely would you hear a child say "oh, no, that's too pretty to cut." They appreciate the gift, relish in the celebration and eat their cake ... perhaps even getting frosting smeared from head to toe. Or, they may take one bite and find the red icing icky. They do not feel obligated to eat it; they'll say "this is icky and I don't want any more." This, my friends is truly living life ... experiencing living in the present moment! 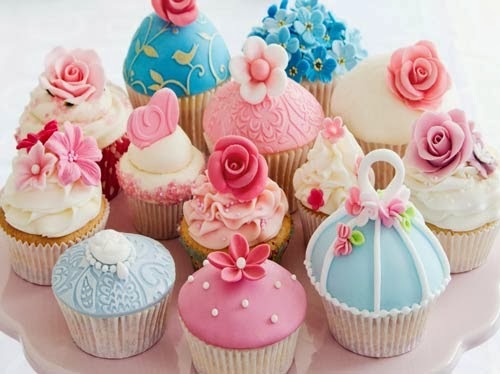 So, I would argue, that if you took one of those cupcakes and ate it in one big bite (swallowing without chewing, tasting, or sensing texture) then you're right ... that cupcake was too pretty to eat. However, if you appreciated it beauty before taking a bite, gingerly fingered the frosting to gauge its texture, brought it to your nose and smelled it, and savored each and every bite, then your experience with that cupcake went beyond its visual beauty. You perhaps found that the taste was even more sublime than its physical appearance. Have you ever seen information about holograms. I saw a video one time (it might have been a segment from "What The Bleep") in which they took a hologram of an apple and cut it into a tiny piece. The entire hologram of the apple was still in that little sliver. We are each created in God's image. This for me does not mean that God looks like us, yet aged and living on a throne somewhere. For me this means that we are each living life as PART OF God/All That Is/I AM. Each of us! I know this is true because of the connection I make when doing healing work with people. No one in this life is greater than you. No one is lesser. We are each a part of and the sum of the All That Is. We each have a note to play in the symphony of life. My note may be bright and clear and your note may be soft and low. Both are integral to the whole! One person who passes away at the age of 49 may have lived a life more complete than another who passes at age 99. The quality of our lives is measured in the LIVING and not in the REGRETTING, WONDERING, FEARING. Know that you are truly Divine and, as such, deserve every treasure you ALLOW YOURSELF to experience. We are here to experience life. Fully! The cupcakes we love and the ones we find icky. Experience ... that is what this physical reality is all about! If you'd like assistance releasing feelings of low self-esteem, please visit my web site and consider a private healing session. You may also view a video related to this post by clicking here!